Today, we will begin rolling out new features and updates to Xbox One for fans all over the world. These updates include new ways to bring your personal media to your Xbox, updates to the party system, more ways to interact with your Xbox, and new social features for Xbox SmartGlass. A new Media Player app: Play media files from an attached USB device with the new media player app – DLNA support for your home media servers is coming soon. Xbox One will support more formats than Xbox 360, including support for dozens of new file formats like Mpeg 2 TS, animated gifs and MKV, which will be added by the end of the year. Party on in the new and improved Party App: Be the leader of your party with the new party leader setting. As the party leader, you can change whether the party requires invitations and you can remove others from the party. The updated app also lets you see what activities everyone in your party is doing and who is playing in the same game with you in addition to being able to quickly perform common actions like muting, joining, or sending game invites. New features for SmartGlass: You can now post status messages from the Activity Feed and comments, or share items from both your Activity Feed and Game Clips. Along with the new comment and share features, a personalized Activity Feed has been added to your profile and messages have been updated to a new layout supporting a full conversation view. Additionally, we are adding the ability to record game clips directly from the Now Playing bar. Finally, for users who upgrade the app directly, we have introduced a What’s New page highlighting the features of each release. “Xbox On” capabilities in Australia, Canada (French), Italy, Spain and Mexico: New regions will have the ability to use the “Xbox On” Kinect voice command to power on their consoles when they’re in connected standby (Instant On) mode. OneGuide comes to Brazil, Mexico, Austria, and Ireland: The ability to configure live TV listings will be available to all customers in these four countries. Also coming to these markets is the ability to use OneGuide and the Universal Remote Control in SmartGlass. Boot to TV: Now Xbox One owners will be able to set their console to boot directly to television when coming out of connected standby. Bandwidth Usage Display: Bandwidth Usage will show users how much bandwidth their Xbox One is consuming over a period of time, a useful tool for those who want to track against bandwidth caps set by ISPs in certain markets. Save your Avatar Gamerpic: A new option to save Avatar Gamerpics to users’ OneDrive. 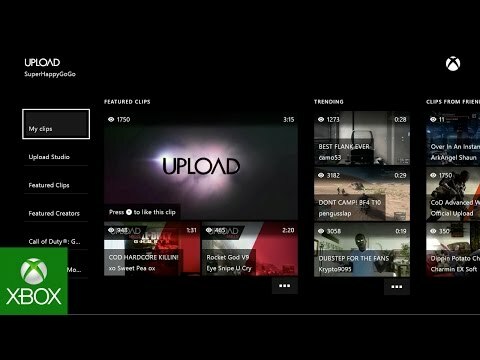 GameDVR deletes: Users will be able to choose multiple GameDVR clips to delete at once in the Upload app. Please continue to share your feedback on our dedicated Xbox Feedback site and you might see your suggestions become a reality in future system updates. Look out for new features lighting up consoles in our preview program in the coming weeks.